One of the most significant selling points for Microsoft 365 is the included security features. Every Microsoft 365 plan includes robust security and management features like information protection, malware protection, mobile device management, and compliance capabilities. If you are already using Office 365, and are looking to add any of these features, it probably makes more sense to go ahead and switch to Microsoft 365 rather than get the add-ons. It’s going to be easier to manage, and probably cost less, depending on the specific add-ons you’re looking at. Another logical time to move your team to Microsoft 365 is when you are already making other changes to your technology. Maybe you need to upgrade everyone from an old operating system (end of life for Windows 7 is fast approaching) or change some Office 365 licenses around to get everyone on unified licensing. Because you are already making changes, it’s easier to rope in a Microsoft 365 changes at the same time. There are dozens of Office 365 licenses and add-ons available for businesses to choose from. On the one hand, you can get exactly what you need for each employee. On the other hand, it can make managing your environment and your budget pretty complicated. Because Microsoft 365 includes a lot of features you’d otherwise have to get as add-ons and includes a single admin portal, it’s much simpler to manage. 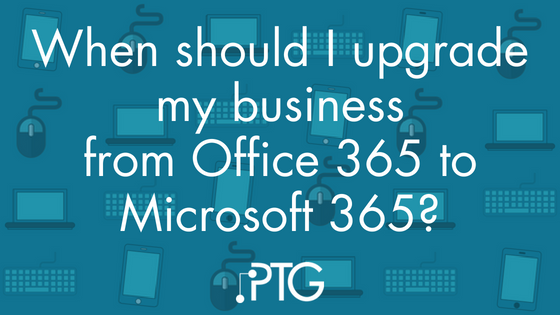 If you’re looking to simplify, it may be time to make the transition from Office 365 to Microsoft 365. According to Microsoft 365 SMB Manager, Bryan Goode, Microsoft 365 Business includes more than $100 worth of products in a single license. Bonus: Microsoft 365 makes it easier to spin up new computers, so it may make your new employee onboarding process just a little bit simpler, too. If you don’t want to move your whole company at once, you don’t have to. Just like you can mix and match Office 365 plans, you can have a mix of Office 365 and Microsoft 365 plans. If you don’t have any of the above scenarios on your radar, it may make more sense to move people in phases. Or, if you don’t refresh all of your computers at the same time, start new hires on Microsoft 365 and move current employees over as their machines are replaced. Whenever you decide to move, check with your Microsoft partner first. Because there are desktop elements involved (especially if you are moving to a Microsoft 365 Enterprise license), it may not be quite as simple as buying a new license. You’re better off having a conversation to check than risking screwing up a critical process or access to a line of business application.